The Heiva is a traditional Dance Festival in Tahiti that lasts a few weeks. Large dance groups coming from the five archiplagoes spend months to prepare for the Heiva; today was the opening ceremony in the "Jardin de Paofai" at sunset. Kite Aerial Photography - Dan Leigh Delta R8 - AutoKAP- Ricoh GX 200 with wide angle converter. 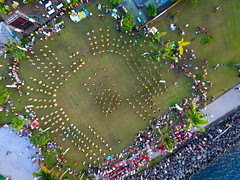 Wind was OK, light was sometimes very warm, sometimes a bit flat, but flying a Kite with a camera between spectators and coconut trees, over dancers, with dozens of kids was REALLY very challenging and this 90 minutes session was quite stressfull! Uploaded by Pierre Lesage on 6 Jun 10, 7.51AM BST.